It has been a while since my last post. The time I have been working has taken much of my energy away from me. Suddenly summer is over in three weeks. I am excited to return to school, but am sad that the summer I am having is coming to an end. It's been a great summer. Working for the city has been great. 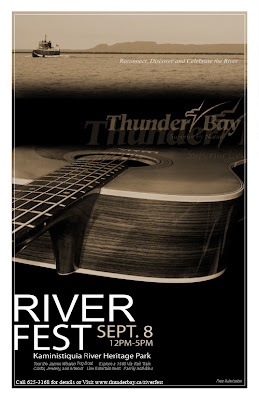 I recently threw together a poster in photoshop for an up and coming event in Thunder Bay. Too bad I won't be in town to attend the event. My boss wants the poster to reflect more images from the actual park the event will be held at. Time for some touch ups. Lately I have been falling in love with opacities. Typography is fun too. I couldn't go too crazy with this poster. Thunder Bay is a little too reserved for some of my ideas. I have two weeks off to reserve my thoughts and maybe sit down to do some artwork. Heart of the Harbour Arts Festival is tomorrow too, I'm excited to see what Thunder Bay offers creatively. My expectations of my home town have risen. I feel like I am seeing things with a new maturity. I'm gonna' bring that back to school this time.